Last week's BBC programme The price of life highlighted the plight of cancer sufferers awaiting a decision by NICE, the National Institute for Health and Clinical Excellence, on a new drug that could add years to their lives. If approved by NICE, the drug, called revlimid and used to treat a cancer called multiple myeloma, could be prescribed freely on the NHS. If rejected, the prohibitive cost would spell the end of the line for many patients. In the light of the suffering facing myeloma patients and their families, the main criterion for NICE's decisions — cost-effectiveness — seems almost inhumane. But exactly what kind of mathematical considerations go into NICE's calculations? Thwack! Grunt! 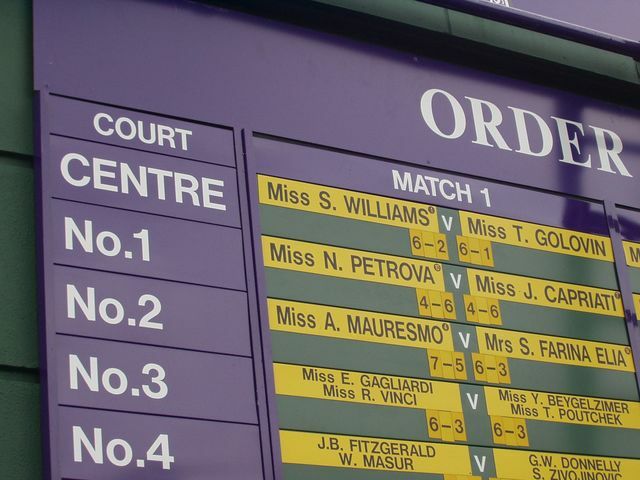 Wimbledon has started! And perhaps the unusually sunny weather this year might be an omen for an unheard of event... could this be the year of a British Wimbledon Champion? We don't have the answer to that question, but you can test yourself and see what it takes to be a Wimbledon champion with our latest puzzle! This poll is now closed. The most popular question was: "What are dark energy and dark matter?" We will publish the answer in an article and podcast on Plus shortly. Thank you for taking part! This is our third online poll in our series to celebrate the International Year of Astronomy 2009. Choose your favourite question from the list on the right, and we'll put the one that proves most popular to world-leading astronomers and cosmologists, including Astronomer Royal Martin Rees and author and cosmologist John D. Barrow. The poll will remain open for a month and the answer will be published in a Plus article and podcast soon after. If your most burning question is not on this list, then leave a comment on this blog and we'll endeavour to include it in a future poll — there will be four more polls dotted throughout the year. The most popular questions in polls far were was What happened before the Big Bang? and Are the constants of nature really constant?. Read the answers by clicking on the links, and discuss them on our blog. Dark matter is possibly "easy" to determine: neutrinos have mass. That simple (but hugely ignored) fact could provide both sufficient mass and energy to explain the otherwise unobserved masses and energies that puzzle us. But how Gravity works - well, that's something I would really like to know. News from the world of maths: Issue 51 of Plus is out now! This special double issue of Plus is cause for celebration: both of the endeavours of physics to understand our Universe, and of the writers of tomorrow who may help explain it. We explore the frontiers of modern physics: searching for alien life in space and exotic particles in the LHC, looking through the Hubble Space Telescope, imagining a holographic Universe, and wrestling with one of the biggest problems in modern physics. And the winners of the Plus new writers award 2009 explore the most beautiful equation of them all, explain the credit crunch, and unveil the curse of good looks. We raise a toast to mathematics and physics — to all the explorers of the new frontiers and the new writers who can take us there! Read issue 51 of Plus! Next time you're off to the bookies to place your footie bets, you might be better off consulting a statistician than a football expert. On his Understanding Uncertainty website self-confessed football un-enthusiast David Spiegelhalter used a simple statistical model to predict the results of the last ten Premier League matches, which were played on the 24th of May 2009. In terms of predicting whether a game ended in a win, draw, or defeat for the home team, Spiegelhalter's model was right nine out of ten times, compared to the seven out of ten score achieved by the official BBC football expert Marc Lawrenson, and the model predicted two scores exactly. Spiegelhalter and his co-authors Mike Pearson and Ian Short quantified the individual teams' attack strength and defense weakness based on their past performance, and then, with a little help from probability theory, used these ratings to work out the most likely outcome of a particular match. (You can see the details of this model on his website.) "These types of models have been refined over the years and are now used by bookies and sports betting companies, who employ experienced statisticians and make use of the latest computational methods," says Spiegelhalter. But he concedes that his very basic model might have been a bit lucky this time: "One thing you can bet on is that simple models like this one will be very unlikely to out-perform the odds being offered by bookies, so don't use them to spot good bets!" Spiegelhalter announced his prediction on the BBC Radio 4 programme More or Less, which was aired before the final match day, so you can be sure that no hindsight fraud was involved. David Spiegelhalter is Winton Professor for the Public Understanding of Risk at the University of Cambridge and regularly writes for Plus (see for example his article on the 2006-2007 Premier League season). His Understanding Uncertainty website is designed to inform the public about everything to do with risk and uncertainty, from health scares to predicting election results.